I was able to steal away to my studio for a little while on Saturday afternoon. Rachel and Adam went to look at houses and Steve went for a kayak paddle. Left me ALL ALONE in the house for about 2 hours. I headed straight for my studio. 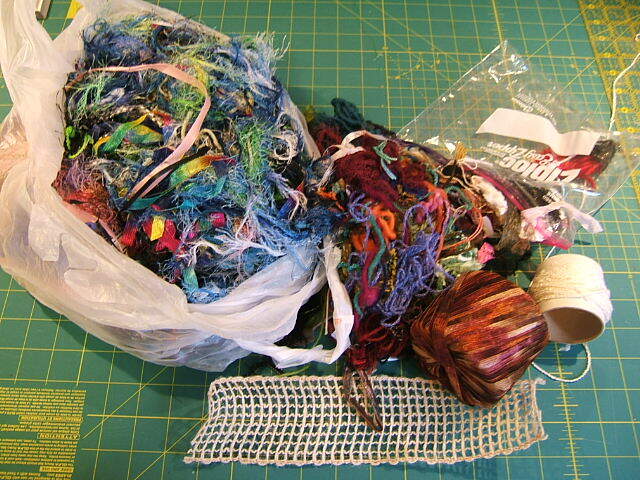 I first spent about 15 minutes re-acquainting myself: petting fabric, rearranging piles, etc. 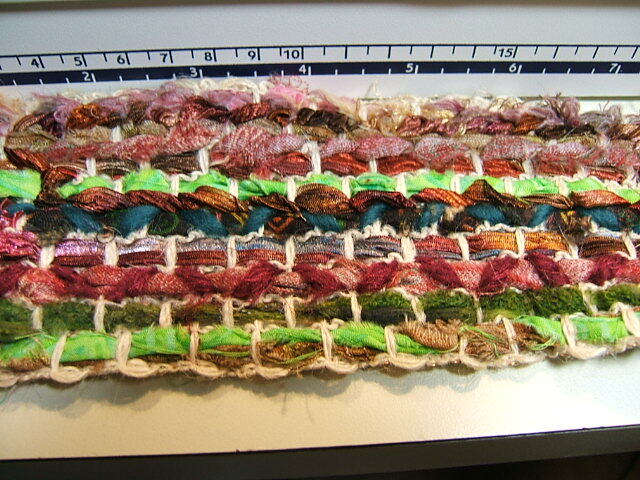 Then decided with the time I had I better not start any of the larger projects calling my name! 🙂 So, pulled out a few odds and ends and made a bracelet. A group I am a part of, FABS, went to Saluda a couple of weeks ago. We went to go shopping at a very cool store called Random Arts. What a neat little store!!! I wish I had thought to take my camera with me!!! It is a store full to the brim with odds and ends: ribbons, charms, “found” objects, copper mesh, cardboard “things”…….. A true treasure trove for any artist. I bought entirely too much stuff, but am looking forward to playing with it all! 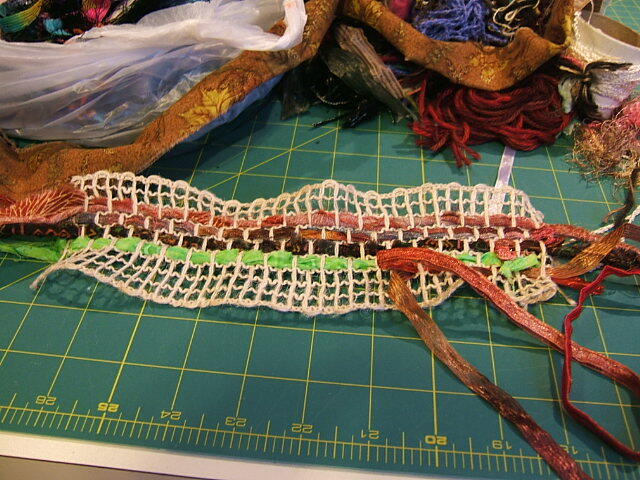 One of the things I bought was this piece of loosely woven fabric that they had used to make funky bracelets. It’s what I played with on Saturday. I got to wear my bracelet Saturday night when Steve and I went to dinner and dance at the local Catholic Church’s Irish night supper. I felt beautiful! 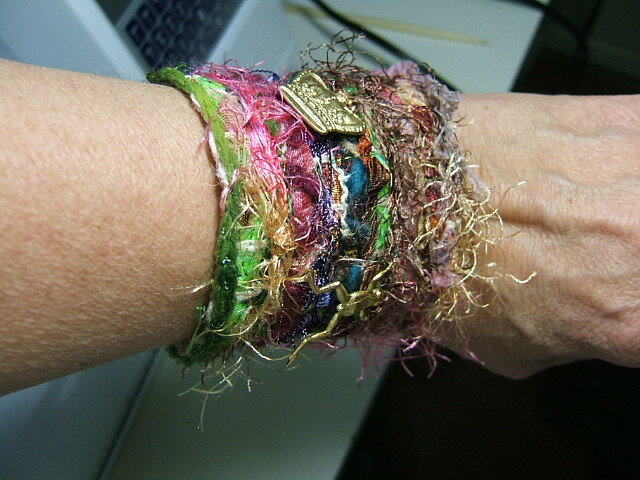 Posted in Fiber Art and tagged art, bracelet, fabric, random art. Bookmark the permalink.